good news, should see if he will or can bring some leinie's. a good wisc beer. like it better than yueling's. Remind when we get closer I'll ask. allright i am signed up if anyone needs me to bring something let me no. Well since it just wouldn't be summer without an 8.5 hour drive, Ford Carlisle, some Mach1s, and some beers... my room is booked for Thursday to Sunday! I'll bring the girl if she can get off work and we will pick up some items for the BBQ when we get up there. Looks like the list is in need of some dessert items so that is what we will get, along with the obligatory 'local brew' or any other beer of choice. 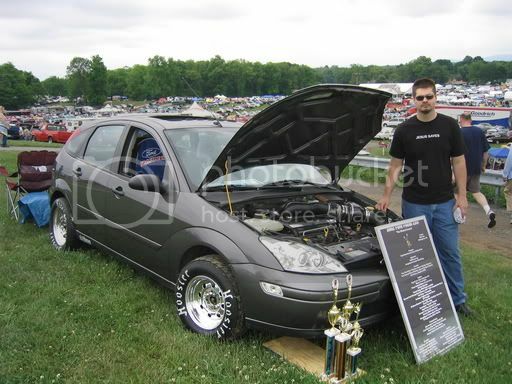 3 months, 2 weeks, 4 days till the All Ford Nationals, Carlisle, Pa.
Got both cars registered for the show today! Expect the Drag Focus there!! I've missed this show last 2 years in a row (other obligations), good chance the car will not be done for this year, I never win! Put in for the vacation days today. Should be set. I have an idea can we get a few dozen antenna strippers ! Dropped the Pan on the 70'....lower bearings look good..some evidence of bearing material in the pan..probably from the Cam bearings.Pressure releif valve seems to have been sticking causing a spike of over 200lbs of pressure at start up, led to a gasket leak at the oil filter block adapter.Installing a new oil pump & block adapter tommorow .If the oil pressure looks good then i got lucky..if it's low then it's time to yank it & change Cam Bearings, in which case i'll be bringing the Shelby...film at eleven on this one !! Chris, I'm hoping for the best. It's Alive !! Fired up the 428 today..great oil pressure, ran smooth..no nasty noises !! Drove it around ..no issues. now I can register and drive it up for Carlisle !! Whew !! Glad it wasn't worse !! Thanks for all the mental support !! Thanks for all the mental support !! is it time for Carlisle yet?... we got 5 inches of snow and sleet, and ice and it's pretty crappy... cmon summer!